One of the self imposed ‘rules’ of my challenge to run 18 half marathons this year was that I had to include at least one race in each part of the British Isles. Northern Ireland was already covered (obviously), and my travels so far had also taken me to England, Wales and the Republic of Ireland. That just left Scotland. Thankfully, the Great Scottish Run in Glasgow was ideally scheduled to allow me to complete the set before I finished my challenge back in London where it all started next month. This was #17 and my fourth in September. I travelled to Glasgow alone, as usual, a couple of days in advance of the race. I like to do this to give me a chance to explore somewhere new rather than just arrive, run and leave again. It also allows me to rest plenty beforehand and soak up the atmosphere. Not that any of that makes one iota of a difference to how I’ll run! I’m not some highly tuned athlete that needs to acclimatise in order to produce an optimum performance. I am what I am, I do what I do. I’m from Northern Ireland. I’m used to it being cold but, my goodness, Glasgow was something else! I don’t think I ever warmed up from the minute I arrived to the moment I left. That could be purely coincidental, there has been a bug doing the rounds and I haven’t felt well since returning. When I say I was alone in Glasgow, I wasn’t really. My club runs an annual trip to this race so there were around 14-15 of us in the city, most of whom stayed in the same hotel as me. But I kept myself to myself largely, through choice. For some reason I felt sad for a lot of my time in Glasgow. Sad and lonely, despite having familiar faces on call if I needed. That thing about feeling alone in packed room very much rang true for me. Anyway, about the race. It forms part of a weekend of running in Glasgow so on Saturday I walked the very short distance from my hotel to George Square to watch the family/kids races. I really enjoyed this, and found it both inspirational and emotional in equal measure. Seeing some of the young kids who had overcome severe adversity in their short lives display such determination to cross the finishing line really pulled on the heart strings. Onto Sunday. Being so close to the start I was able to go out and watch the 10k waves get underway before returning to the hotel to get ready for my own race. That done, and several trips to the loo later, I was good to go. I made my way to the pens and almost immediately bumped into Michael, one of my running buddies from Diabetes UK and whom I spent a long time with in Swansea back in the summer. It was great to see him again and catch up, he’s faster than me so I knew I wouldn’t see him during the race! 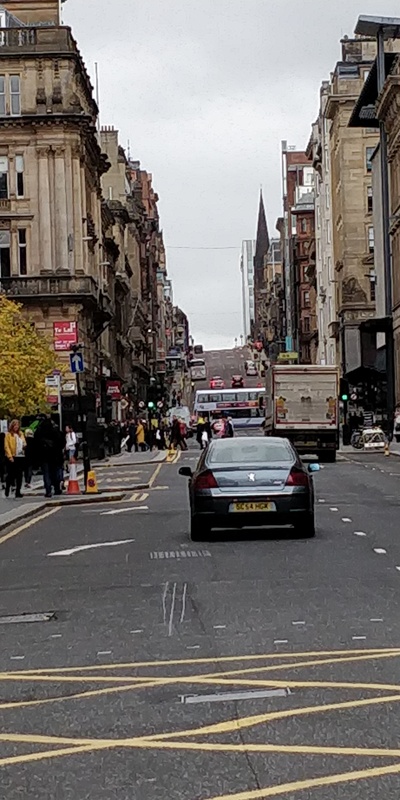 If you know the Great Scottish Run you’ll know it starts with an almighty climb up St. Vincent Street. It looked quite daunting and it wasn’t for the faint hearted but it was good that it came right at the beginning when fresher legs are better equipped to deal with it. I intended taking it slowly but with the adrenaline flowing it was difficult to do so. Knowing that I’d gone up it too quickly I made the conscious decision to make my second mile a very easy one just to allow my legs time to recover, so I dropped right down into a gentle jog. Mile three brought me back up to speed but, for some reason, my fourth mile was even slower than the second. I’m not really sure why but this trend continued for a while – fast mile, slow mile – until, just after the halfway point, I settled into a bit of consistency. Not that I was struggling or anything like that, it was just how it went. I felt I was running ok actually. Going into the race I had taken all pressure off myself as regards pace or time so perhaps being more relaxed was paying dividends. I wasn’t going to set a personal best or anything like that (the inconsistent start put paid to that) but I was doing alright. I was enjoying myself going through the Glasgow parks and taking in some of the sights of the city. Perhaps what I liked most about this one was the varied entertainment on route. There were pipers, lots and lots of pipers, as you’d maybe expect. There were also bands, dj’s, circus performers and, would you believe?, belly dancers! It was fantastic. The local support out on the route was something else I really enjoyed. I can’t remember what they were saying or shouting but I did smile a lot. Approaching the finish I felt content with my run, not my best time but nowhere near my worst either. An enjoyable run, all told. I did feel a bit emotional at the end and took myself off to a quiet corner just past the finish line to have a moment. Obviously I was spotted because within moments this woman came rushing over to check if I was ok. I thanked her and reassured her I was fine. I only felt the emotion because I knew I had only one race left to complete the 18. If I felt like this now I can only dread to think what I’ll feel like after my last one! Previous #18in18 – two left!